Fulfilling the needs of vineyard owners and managers in the Oregon wine industry has been the primary focus of Pihl Excavating since our inception in 1996. With a great appreciation for Oregon wines and the art of creating them, we approach the task of preparing land for vines, whether it be removal of existing orchards or the clearing of fallow, overgrown and scrub lands. Pihl Excavating provides a full range of ground preparation services for vineyard managers and owners. 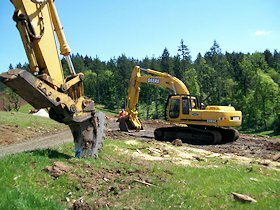 Whether it is land clearing, site excavation, road building or maintenance, reservoir construction, or surface and sub-surface drainage, Pihl has the expertise, equipment and personnel to transform your land into a productive vineyard property. At Pihl we have the capability of ripping ground at six feet and often times do. The purpose of deep ripping is to fracture the ground to promote consistency in the rooting zone (photos on bottom). To pull these rippers through the earth requires extreme horse power and traction. Pihl has three D9's and one D8 for this purpose. In our area there are few dozers this size available.